No. 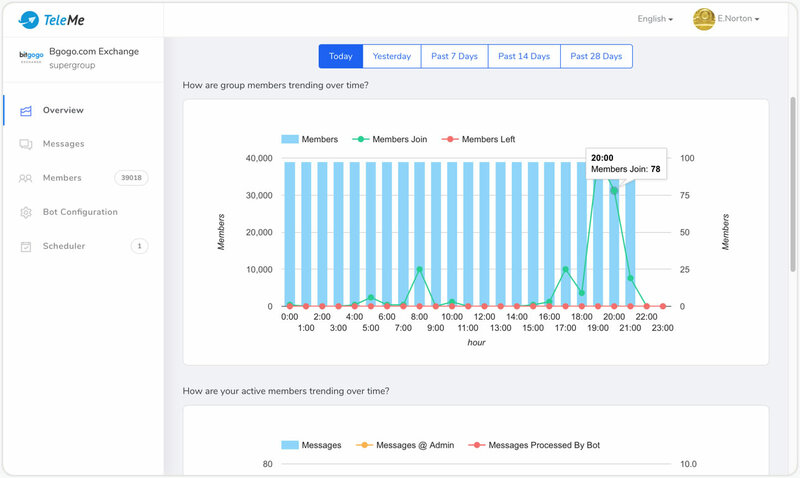 1 Telegram Bot for Group Management and Analytics. The easiest way to manage telegram groups. TeleMe's flexible tools are designed for any telegram community. Plan ahead, set bot rules and track member interactions. From anti-spam to daily scheduled tasks tools, we've got you covered. Work closely with your team. TeleMe is seamlessly integrated with Telegram system. All your community moderators work together on the same platform. Get instant, clear insight into all activities of your Telegram groups. TeleMe provides comprehensive analytical data for insight into group activities. Enjoy fine-grained tools for managing each individual member of your group. Search through all members in your groups. View activities of each individual member and manage restriction of them. Start right now. No obligations. No credit card required.